Born on 9th November 1957 at Sedgefield, County Durham, David "Dave" Hockaday started his playing career with Billingham Synthonia, as a youth player in his native County Durham. He was signed by Second Division Blackpool in June 1975. While he played a handful of games for the Seasiders after making his debut for them in a 1-0 home win over Chelsea on 25th September 1976, it was not until the 1980-81 season that he cemented a regular spot in their first team. While Blackpool suffered relegation on a souple of occasions and slumped to the Fourth Division, he went on to score twenty-four League goals from one hundred and thirty-one starts and a further sixteen appearances from the bench. He also scored twice in a dozen games in the F.A. Cup and once in thirteen Football Trophy and other games and also made twenty League Cup appearances, without scoring for a total of twenty-seven goals in one hundred and ninety-two appearances before leaving for Fourth Division Swindon Town on 13th June 1983 on a free transfer. After making his debut at Outside-Right in a 1-0 win at Chesterfield on 27th August 1983, he became Swindon's regular right-back, and held his place until surrendering it in the 1989-90 season to David Kerslake, who later played for Leeds. While with the Wiltshire side he scored seven goals in two hundred and thirty-four starts and eighteen as a substitute and started eighteen F.A. Cup ties and made two more from the bench without scoring, together with two goals in twenty-one starts in the League Cup and a further two goals in fifteen Football League Trophy and other games for a grand total of eleven goals in two hundred and eighty-eight starts and twenty games from the bench. While with Cherries he gained a Football League Fourth Division champions medal in 1985� and was a regular in the following season which saw Swindon gain promotion to the Second Division via the play-offs. 1988-89 saw Swindon reach the play-offs for the top flight, but after being an ever-present that season he was at right-back in both games with Crystal Palace which saw Swindon win the home leg 1-0 before being eliminated as they lost the Selhurst Park leg by 2-0 on 24th May 1989. He lost his place to David Kerslake before the halfway stages of the 1989-90 season which saw Swindon win the play-offs for promotion to Division One. However, financial irregularities, mostly for illegal payments to players, saw them relegated to the Third Division before being re-instated in the Second Division rather than promoted to the First Division. On 13th September 1990 he left Swindon for Second Division Hull City at a fee of �,000. His first season at Boothferry Park saw his club relegated to the Third Division. After being a regular in that season he could not always be assured of a place in the two other seasons that he spent at Hull as the club sruggled in the Old Division Three, which became known as Division Two on the creation of the Premier League in 1992-93. He joined Stoke City on loan in March 1993 and made seven League starts as Stoke won the Second Division Championship. He scored twice in seventy-two League games and once in four League Cup games and together with three games in the F.A. Cup and four games in the Football League Trophy he totalled three goals in eighty-three games for Hull before leaving for Shrewsbury Town on a free transfer in August 1993. He was almost an ever-present as his new club became champions of the Third Division in the 1993-94 season but after forty-six League starts and two games from the bench as well as four F.A. Cup, six League Cup and three Football League Trophy games for a total of sixty-one games without scoring he went into Non-League football with Cirencester Town in 1995. When his playing days were over he helped set up the Football Academy at Cirencester and started his coaching career with Watford where he was first youth coach, where he nurtured the talents of several future stars, before taking over the first team coaching role in 2005 under Aidy Boothroyd and helped pilot Watford to promotion to the Premier League after the 2005-06 season. As Watford struggled in the EPL he was sacked in January 2007 and he joined Milton Keynes Dons, under Martin Allen, in March 2007 and helped get them to the League Two play-offs. After Allen had joined Leicester City Hockaday joined him there on 6th June 2007. On 19th June 2007 he joined Southampton as youth coach and helped to develop several young players before moving up to become first team coach. He was sent on leave in January 2009 before having his contract terminated in May of that year, after having briefly assisted Martin Allen at Cheltenham Town in March 2009. He was appointed Manager of Forest Green Rovers in September 2009. Despite the club's financial struggles he managed to get them to the Third Round of the F.A. Cup. But he could not stop the club from ending the season in the relegation zone, but they earned a lucky reprieve when Salisbury City's demotion for financial irregulatories saw Rovers stay in the Blue Square Premier League.The 2010-11 season saw another battle for survival with relegation being avoided by goal difference. With improved financial backing Hockaday was able to acquire better players and took the club to tenth place in the 2011-12 season. This was followed by another tenth place finish in 2012-13, despite the club having the highest wage bill in the League. After being associated with the Swindon Town Manager's position in February 2013, a poor start to the 2013-14 season saw Hockaday leave the club "by mutual consent" on 21st October 2013. He was appointed "Head Coach" of Leeds United on 19th June 2014 with a two year contract. His record at Forest Green Rovers was Played 189 Won 64 Drawn 50 Lost 75. 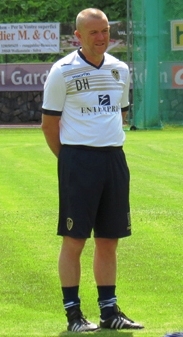 Underwhelmed by his appointment, the Leeds supporters could only watch as the preseason unfolded with a shambolic tour of Italy, which saw a 16-0 win against Italian amateur side FC Gherdeina, who at best would have been struggling against teams from the lower echelons of the Leeds Sunday League, and the second opposition, Romanian Liga 1 side Viitorul Constanta did not turn up for the game on Sunday 13th July at Mulin De Coi, Santa Cristina and Leeds were reduced to playing themselves, with an impromptu Whites v Golds and new signing Soulymane Doukara showing his paces with a few laps of the pitch. The return to England saw a 2-0 win over local side Guiseley. This was followed by a 0-2 loss to League Two side Mansfield Town, a 2-2 draw at League One team Chesterfield and finally a narrow 2-1 win at League One side Swindon Town. It was rounded off by a 2-0 win at Elland Road against Scottish side Dundee United. The League campaign was no improvement as it saw United defeated 0-2 by Millwall at the Den on the opening day, followed by a scratchy 2-1 win over League Two Accrington Stanley in the League Cup. There was a ray of hope as Leeds registered a 1-0 home win over Middlesbrough in their second League game of the season but successive defeats by Brighton and Hove Albion and Watford saw Leeds back in the danger zone and the Leeds owner announcing that he was going to sack Hockaday, but then having a change of heart and giving him a further chance. However the defeat by League One opposition in the League cup, when Bradford City beat them 2-1 at Valley Parade sealed his fate and this time the axe fell. On 28th August 2014, Hockaday and his Assistant, Junior Lewis were dismissed having been in the position for just seventy days. He was appointed in an advisory capacity by little-known Non-League team Swindon Supermarine in November 2014 and later in that month his new club asked him to take on the role of Assistant Manager. The move was only of a temporary nature and his return the League football with League One side, Coventry City was announced on 2nd February 2015 as he was appointed professional development coach for the rest of the season. He assisted with the first team in addition to coaching the Under-Twenty-One team. When Manager Steven Pressley departed, on 23rd February 2015 he became joint caretaker-manager with Neil MacFarlane. The role lasted for just two games, which shoed a win and a loss before Tony Mowbray came in as Manager for the rest of the season. In October 2015 he was appointed Head Coach of National League side Kidderminster Harriers. On 31st October he took them to their first win in twenty-two games, but inevitably, with the club marooned at the bottom of the ladder, he wasdismissed on 7th January 2016, when they had won just two games under his charge. He then opened up a Football Academy for young players in Wiltshire and then, in October 2016, he was appointed Head of Male Football at South Gloucester and Stroud College.